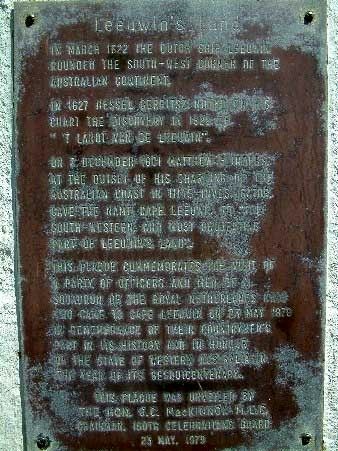 A plaque commemorates the European discovery of the coast by the Dutch Ship Leeuwin. The land discovered by the Leeuwin was recorded on a 1627 map by Hessel Gerritz ("Chart of the Land of Eendracht"). The plaque also commemorates a visit by a party of men from a squadron of the Royal Netherlands Navy in 1879. The plaque was unveiled during the sesquicentenary celebrations of the state of Western Australia. In 1622, the Leeuwin became the fifth Dutch vessel to chance upon Australia’s western edge–this time the continent’s south-western tip. Poor navigation appears to have led to the ship becoming the first to discover Australia’s south-west tip, and to the length of the Leeuwin’s voyage. The voyage from Texel, in the Netherlands, to Batavia had taken more than a year, when other vessels had completed the same voyage in four months. Although the ship’s log has been lost, VOC (Dutch East India Company) letters revealed that the Leeuwin was the first vessel to sail the continent’s most southerly latitudes. From the map’s descriptions of the local shoals, reefs and islets, it would appear the ship had sailed along the coastline between Hamelin Bay and Point D’Entrecasteaux, near present-day Cape Leeuwin.